The Pittsburgh Pirates placed staff ace A.J. Burnett on the 15-day disabled list on Thursday evening due to a strained right calf muscle, an injury that Burnett disclosed to Pittsburgh manager Clint Hurdle on Wednesday. Since the injury was announced, Pittsburgh has not disclosed how the strain came about. Due to a lack of information on the severity of the strain, Burnett’s timetable for a return to the rotation is still unknown. A minor calf strain may require a healing time of around two weeks, while a more serious strain may require up to three months of recovery. In 14 starts this season, Burnett has provided the Pirates with veteran leadership and an anchoring stability at the top of the rotation, posting a 3-6 record (a result of a lack of legitimate run support) and 3.12 ERA. 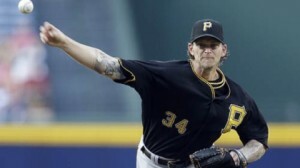 In addition, Burnett boasts a 99/35 strikeout to walk ratio in 89.1 innings of work. In his most recent outing on Saturday, Burnett dazzled in a 6-2 victory over the Chicago Cubs, going 8 1/3 innings and surrendering just two runs on four hits. Behind the leadership of players like Burnett, the Pirates have ranked amongst the best teams in the National League this season. Pittsburgh currently boasts a 39-27 record, the third best record in the NL. The intriguing part about such is that they sit third in the NL Central standings, illustrating the strength of the NL Central division this season. With Burnett joining the DL, starting pitcher Charlie Morton will make his season debut on the Pittsburgh roster after undergoing Tommy John surgery last June.